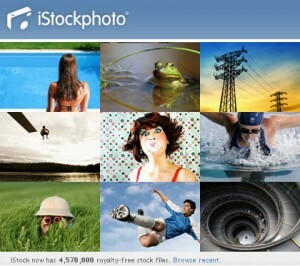 Home »Photography»iStockphoto for royalty-free images. Ever work on a photo composite and need just one more image … well, iStockphoto is your answer. We have all used the large stock houses like Getty Images, Corbis, Creatas, Comstock, Jupiter and megahouses like Super Stock. But, have you used a micro-stock house? iStockphoto was the first, but more are growing fast. Micro-stock houses have a direct relationship with the photographer and pay between 20%-50% royalty on licensed (purchased) images. For the average photographer, this is a much higher royalty-rate than the established houses. The trade-off is micro-stocks push volume at much lower image rates than the established houses. For example, prices at iStock range from $1 to $21 for royalty-free images whereas Getty Images start at $89 and goes up depending on image size and use. Charging more for an image with a very prominent venue (ex. magazine cover, billboard, TV, etc.) is very common. Well, if you are working on a photo composite, the completed work is more important than any one image. As a result, trying to justify spending $2500 for image licenses on top of your artistic hourly rate may be a tough sell. Budgets are tight and getting tighter. Wouldn’t you rather lump it all together into one neat bill knowing that 90% goes directly to you?? Micro-stocks let you do that. iStock’s success has attracted better photographers and better quality images. It also has attracted competitors like Fotolia, Dreamstime, Shutterstock and Stockxpert. A wider selection makes it easier to find the perfect image. You may even find the same image on multiple sites. Royalty-free: once licensed, the image can be used unlimited times for the set duration without paying additional royalty fees. Rights-managed: a license fee will be required for each use depending on factors like duration of time used, geographic region, industry, size published, and type of venue. Subscriptions: a variation of either royalty-free or rights-managed stock where you commit to a monthly subscription and a number of images per month. ← Previous Previous post: Tenba Shootout – my new camera bag!